I’m not sure why, but the day we visited Kawit, the sun seemed hell-bent on melting us like candles to the ground. A minute after leaving the hidden confines of Hidden Tapsihan the group seemingly transformed into a gang of thugs with headwares, bandanas and scarves wrapped around our head to ward off the intense sun. A rigid statue of Gen. Candido Tria Tirona, Magdalo Council’s Secretary of War, silently greeted us as we approached our next stop, Kawit Church. The sculpture marks the birthplace of the 1896 Revolution hero who sparked the mutiny in Cavite by disarming three guardia sibil. Directly at the memorial’s back looms the old church we came to see. Formally known as the St. Mary Magdalene Church, the brick structure stood proudly against the bright blue sky. Initially built by Caviteno families from Silang and Maragondon in 1638 with wooden materials, its roof was washed up by a storm in 1831. The administration was transferred to the Secular Priests and then to the Recollects through the years and in 1737 it was rebuilt to its current state with the latest restoration done in 1990. 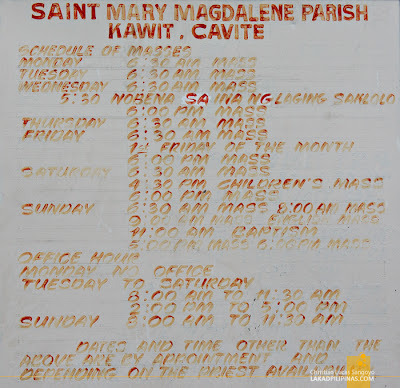 Seeing that the town was slowly turning into a red light district due to the incoming marines from Spain, the then Manila Archbishop sought to turn Kawit into “the most Christian community in the islands” by assigning St. Mary Magdalene as the town’s patroness. The church is built with bricks complimented by exposed architectural columns dividing the façade into four equal parts. The upper half of the church is pierced by four huge rectangular windows and is capped on the left by a triangular pediment housing a statue of St. Mary Magdalene for the body and an octagonal belfry rising a storey higher on its right. The dimly lit interiors of the church looked magnificent. The walls are made of the same brick material as the exterior, pierced with arched windows depicting the Stations of the Cross in colorful stained glass. Flags bearing the patroness’ initials line the hall, reminding me of medieval castles. The ceiling is finished in dark wood and is accented by beautiful chandeliers that extend from the entrance to the altar. The domed transept is similarly done in concentric wood strips and it was quite a sight to behold. The church retablo is painted in gold and holds the statue of the patroness. An interesting artifact lies at the left corridor of the church. Encased in glass, the tattered birth certificate of the First Philippine President, Gen. Emilio Aguinaldo is displayed for public viewing. The document looked as old as it probably is and the handwriting marking the documents was exquisitely archaic. It actually took us two visits to completely document Kawit Church with our cameras, the church being locked the first time. But all that backtracking from the Aguinaldo Shrine and Kawit Church paid off in the end as the church finally opened and its interior lighted for a mass celebration. My most favorite church! Dumadaan ako dito to pray before going to school... The school beside it (St. Mary Magdalene School) is where I spent my formative years, from Kinder to 4th year High School. It's been a while since I last visited this church. Nadaanan lang namin yan before pero hindi namin nakita yung loob. Sarado din sya noon so like you hindi rin namin nakita on the first attempt. Ang ganda ng loob! Sana makita rin namin syang bukas next time! You really do a good job featuring Churches..